Celebrate your Cancer Free life each time you carry your belongings in this Cancer Survivor Tote Bag. Show that you have outwit, outplayed and outlived cancer for years. 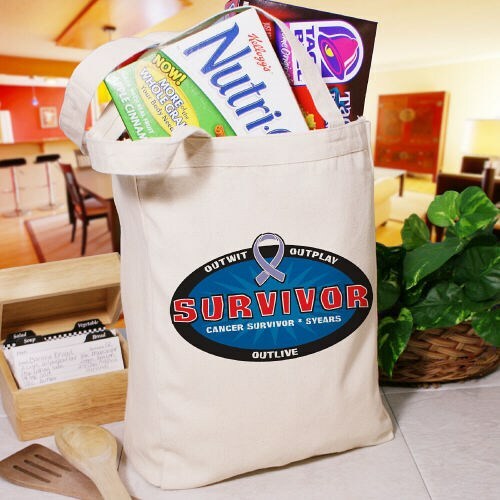 This Personalized Cancer Survivor Tote Bag is perfect for any cancer awareness walk events and helps the world’s largest movement to end the disease. Additional Info By showing awareness, you will help support Cancer and also help fund research for a cure. Be sure to also promote awareness with any of our Personalized Cancer Survivor Apparel. Also, view our Cancer Survivor Sweatshirt and our Cancer Survivor Hoodie as well. Feel good knowing that for every purchase made, MyWalkGear.com will donate a portion of the proceeds to help find a cure.